It’s a beautiful day and you are out walking your loose-leash trained dog when suddenly a rather large ball of fur comes barreling towards you. It’s a dog and it’s off-leash and if the owner is nearby, chances are s/he will tell you not to worry, the dog is friendly. That means absolutely nothing to your dog who may react in an unfriendly manner towards the intruder. The off-leash dog is invading your dog’s personal space. To compound matters, your dog is restrained by the leash and can’t avoid the rushing dog. The unequal footing of your dog only adds to the stressful situation. Here are some tips to help if you experience this situation. Carry treats with you on walks. Toss a few toward the running dog. Hopefully the treats will interest him enough to stop running to you and your dog. If the dog appears friendly, stand in front of your dog. Hold your hand up, palm forward signaling stop. Use your stop voice command as well. 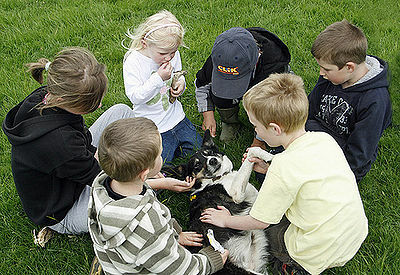 Carry a small can with you on walks filled with little stones or marbles or coins and toss it towards the rushing dog. The noise may startle the dog into stopping. If you have an umbrella with you, the act of opening it may shock the dog into stopping. 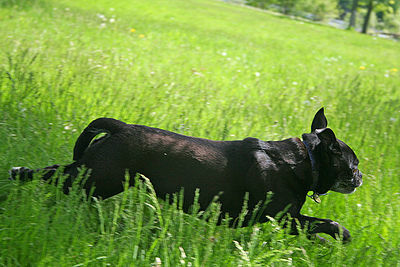 There are situations when the dog running towards you appears to be aggressive and may be in attack mode. Be prepared with a spray available commercially that will stop the dog without harming him. Don’t use pepper spray as it is not safe and can cause injury to the dog. If it’s a windy day, the pepper spray can turn back on you and your dog too. If the owner is present, ask him/her politely to control the dog. You can always say that your dog is not friendly and a fight may ensue. Most communities have leash laws. There are designated areas such as parks where dogs can run off-leash while still being supervised. Always be prepared with a means of protection while out walking your dog as there are those people who ignore the laws.